The Blue Gallery displays the European and American paintings collected by Mrs. Bair and her daughters Marguerite and Alberta. The gallery includes work by Edouard Leon Cortes (1882-1969), Dietz Edzard (1893-1963), Edward Potthast (1857-1927), Lewis Henry Meakin (1850-1917) and others. The museum will feature hand colored photographs by Layton Alton Huffman (1854-1931) from the collection of the Yellowstone Art Museum in Billings, Montana. Charles M. Russell (1864-1926) was a man familiar to most Montanans as the cowboy artist. Charles Bair and Russell probably met around 1897, although the exact circumstances are unknown. 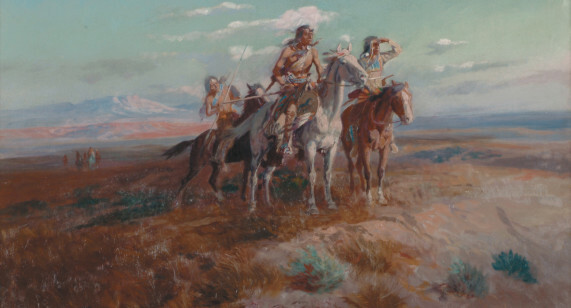 In 1903 Bair purchased Russell’s paintings The Scouting Party (shown here) and Roping a Steer. The Bair Family Art Museum, built in 2011, sits adjacent to the late 19th century Charles M. Bair family home along the Upper Mussellshell River. The Bair site is just north of the majestic Crazy Mountains and west of the Castle Mountains. 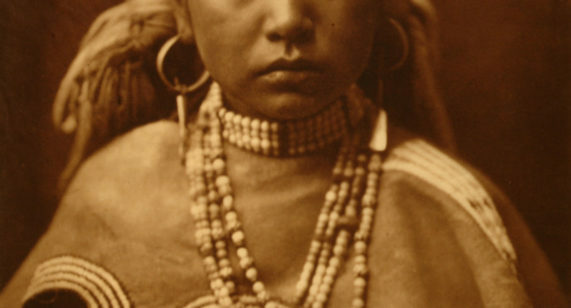 The museum features five state-of-the-art, climate controlled galleries that present the Bair family’s Native American collection, western paintings by Charles Russell and Joseph Henry Sharp, Edward S. Curtis photogravures, and a diverse collection of modern European and American paintings.